NOWSPAR 5th Anniversary On Today! [26.05.12, Lusaka] Today men, women and children in sport attire thronged through the Great East Road led by the Permanent Secretary of the Ministry of Sport Mrs. Musunga, in celebration of NOWSPAR’s 5th Anniversary. The procession arrived at Arcades amidst pomp and splendour leading to a crescendo of vivid ZumbaTM Fitness demonstration, Karate and Judo as well as traditional dancing while Professional Boxer Catherine Phiri demonstrated her sparing skills. NOWSPAR is a Zambia organisation established by former Judo President Matilda Mwaba in 2006, with the aim of fostering increased women’s participation in sport by addressing gender issues. The commemoration will continue tonight at a dinner gala at Intercontinental Hotel in Lusaka at which NOWSPAR will launch the Women in Sport Hall of Fame. This inaugural induction will induct five women, who have made invaluable contributions to the sport society, elevated the status of women in sport, made enduring contributions to their sport and have inspired or supported others and have pushed boundaries to get to their level. ‘Our core interest is securing women’s right to and through sport. This is not easy because it means challenging the gender norms and questioning the values of our society around women and around sport. These two are not the most valued in our country in view of the low attention they both get; there are lots of words but little action from duty bearers. I founded NOWSPAR to change this.’ Matilda Mwaba said. The dinner gala will be graced by the permanent secretary of sport, Ministry of Education, representatives of the Norwegian Olympic Committee, Women Win of Netherlands and several civil society and corporate institutions. NOWSPAR has over the last few years been outspoken on issues including women’s limited access to resources in sport and media coverage. The organisation has been engaged in ground breaking initiatives including securing land for sport in rural areas, lobbying government for increased funding to sport for women and a campaign on prevention and protection from harassment and abuse of women and girls in sport. In 2012 the N ational Organization for Women in Sport, Physical Activity and Recreation (NOWSPAR) will be commemorating 5 years of implementing its programs to advance the rights of women to and through sport. The commemoration activities are aimed at sharing with all members, partners and friends of the organization the work that NOWSPAR has been doing, how our organisation has developed and where we are taking our work in the near future. It is a celebration of women in sport and their efforts to stand for themselves and claim their rights to sport and physical activity. This celebration will be an opportunity to commemorate a mile stone in the development of our organisation, at a time when the women’s movement in Zambia was moving at full speed, there was a gap, no one was addressing gender equality issues in sport. So we mobilised ourselves to meet this need and we have since developed into an organisation that is focused on this mandate. This milestone is important for us to share with the public and our stakeholder the progress we are making in addressing various gender issues in sport and to give them an opportunity to engage with us about our plans and our organization. This event is also important to us as we will be providing an opportunity for initiation of partnerships with more stakeholders, both corporate and civil society to invest in the work we are doing. Our work has over the last five years been diverse, from providing a ball to a group of girls setting up a netball team, to supporting professional athletes to compete in international competitions. We have supported sport organisations to review their policies; we have contributed to government policy and legislation on sport. We are mentoring girls and women in sport and proving advocacy training to youth sport leaders in the aim of creating a critical mass of women in sport that are empowered and speak for themselves. We are sitting on the International Working Group for Women, We are on the advisory Board of the International Kicking AIDS Out Network and hold the Chair of the Board of Directors of the Sport for Social Change Network in Southern Africa. Our campaign work has stretched from the sports fields where community coaches work to palaces of traditional leaders. We have reached government officers and the parliament to the SADC region forums. We have even crossed the oceans to make our voice heard by the Commonwealth and the United Nations. All this because we believe Every Body Matters and that women have a right to sport which must be secured as part of the broader gender, human rights and development agenda. We have been able to do all this with support fo our government through the ministry of education, and sport, the Nowergian Olympic Committee, Women Win, the German Embassy and several corporate organisations in Zambia and beyond. Of greatest significance is the cadre of volunteers who hold up the roof of our organisation, the students, researchers in Zambia and beyond and the members of our talent bank. We further recognise the other women in sport organisation around the world who started before us, their inspiration and open sharing has been helpful. The work is far from done, so we remain a critical player in the sport for development community and broader civil society. We still have to face the challenge of harassment and abuse of women in sport, we still have to continue tackling the limited leadership space for women, the narrow coverage by media as well as the low resources that reach women. We have to work hard to maintain the relationships we have established, to build on the gains we have made and to strengthen the stakeholder bonds locally and at international level. To those who didn’t believe in us, we say ‘look we did it anyway’ to those who believed in us, we say thank you and to those we have served we say ‘you are welcome’. We are holding a public exhibition on Saturday 26th May at Arcades Mall from 9:00am to 15:00hrs. We have a photo exhibition, sport demonstrations and lots of information being presented in various visual and audio methods. This will be an open and free event, to show everybody what NOWSPAR is and what they are working on. We are also producing commemorative magazine with lots of content about our work and the stakeholders we work with. We invite you to advertise in this space. Further we will hold a reception in the evening to celebrate our stakeholders. Thank you for your support and we look forward to your continued support. We are pleased to invite you to join us in celebrating 5 years of our work promoting women’s rights to and through sport and physical activity. NOWSPAR has over the last five years worked tirelesly to ensure women and girls are on the sport agenda and that sport stays on the tabl of the gender debate. We have worked with individual girls and women in sport to promote their visibilioty as well as enabling them to claim their rights to safety and just treatment. We have been involved in directly working with communities to support them develop sport clubs that are open and supportive of women. We have suported sport associations to develop policies and skills to get more women and girls involved. We have highlighted issues ranging from leadership, media, gender based violence, resource allocation and opportunities among others. We have done all this with the support of partners locally and internationally, we would like to celebrate and thank you all for taking this journey with us. So join us for a special event on Saturday 26th May. 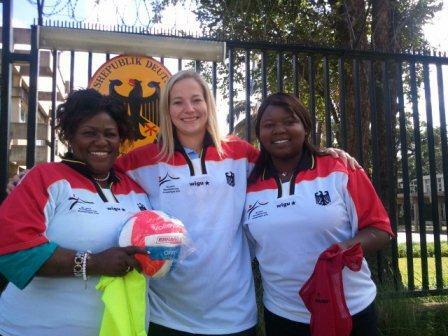 The German Embassy in Zambia has donated sport equipment to NOWSPAR in recognition of our work to enhance access to sport by girls and women over the last five years. The presentation was made by Consular Affairs, Cultural and Press Affairs Secretary Ms. Illona Kankam-Boadu. NOWSPAR Director Ms. Mwaba recieved the equipment after a meeting at which they discussed development of sport and NOWSPAR programs. The donation included 30 volleyballs, 1 set of football jerseys and 2 sets of bibs. The German Embassy has been a supporter of NOWSPAR since 2010, contribution has included coaches training, women’s world cup promotion, sports events and equipment. This year NOWSPAR celebrates 5 years of advocating for the rights of girls and women to and through sport.